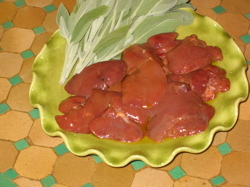 Uncooked chicken livers and sage. Every fall I start thinking about how I’d love a nice plate of hot chicken livers. Creepy craving, you might think, but it’s one of my weather-and-food associations that surface every year with the first chill. I believe it has something to do with my first restaurant job and a dish the lunch chef taught me to make, something she said was a good transitional dish to ease our bodies and souls into cold weather, a French country salad. It was a frisée salad made with a mustardy dressing and topped with seared, pink-inside chicken livers that had been flamed in cognac (I remember the chef telling me that cognac or brandy was very important for flavor, and she was right; it seems to take away the livery bitterness and replace it with sweetness). I found this salad absolutely delicious, still light and summery with all its greens and coolness, but rich with hot liver nuggets. I’d never had chicken livers cooked like that before; pink and custardy inside, bordering on raw, but seared crispy. Eating this salad made me feel like an elegant, wild beast. I’d always been fascinated by my cats and the way they’d lose their minds when I brought chicken livers home, screaming, tearing at the package, clawing them and dragging them under the couch. Listening to their growling and tearing and seeing their glowing eyes, I knew they were on to something good. I thought about the other foods my cats have always loved, squid both raw and cooked, pork fat raw and cooked, sardines raw, cooked, and canned. I realized I should just look to them for culinary guidance. Since my first cooking job, I’ve associated well-cooked chicken livers with Italian cooking, and luscious pink livers with French cooking; not exactly correct across the board, but this conception does linger. A very good dish of penne with chicken livers that I’ve ordered for years in a red-sauce place called Ralph’s on the West Side is an example of an old-fashioned but fine way of cooking these livers. Of course it includes tomatoes. I’ve played around with this marriage of ingredients at home, refining it just a little with fresh herbs, vino, better olive oil, and, most important, by cooking the livers lightly, not in the traditional, gray, ragu mince Ralph’s presented (which I loved better until I tasted the creamy, shockingly raw morsels placed on my bistro salad). I cook the livers for my pasta to a pinkness, a bit more cooked than the seared and raw salad version, but still creamy inside. I’m very happy with the results. I understand that many people are grossed out by chicken livers, but I really encourage you to try the quick-sear method with the cognac finish; it produces a luxurious result. I also include here a recipe for the classic Tuscan chicken-liver pâté usually served on crostini. I don’t sear them raw for this, but they’re not hammered either, so the pâté is smooth and moist. This is a great mush of flavors: capers, cognac, sage, and a touch of anchovy. It’s complex and really lovely. In a large sauté pan, heat 2 tablespoons of olive oil over medium high heat. Dry the chicken liver chunks well. When the oil is hot, add the livers, and sear until well browned on one side, about a minute. Turn and brown the other side, seasoning them with salt, black pepper, and the pinch of sugar. Add the splash of cognac or brandy, but be careful of flare-ups. If you wind up with a high flame, turn off the heat and just let the alcohol burn off slowly. Remove the livers from the pan (they should still be pink in the centers). Add 2 tablespoons of fresh olive oil and the leeks, and sauté until softened. Add the garlic, the rosemary, and allspice, and sauté a minute longer. Add the splash of white wine, and let it bubble a few seconds. Add the tomatoes, and simmer for about 6 minutes. Cook the lasagnette al dente, drain, and pour into a large, warmed serving bowl. Drizzle with olive oil, scatter on the parsley, and give it a toss. Add the livers back to the sauce just to warm them through. Taste for seasoning, adding more salt or black pepper if needed. Pour the sauce over the pasta and toss gently. Grate on a little Pecorino and serve hot, bringing the rest of the cheese to the table. In a medium skillet, heat the olive oil and over medium-high heat. Dry the livers well, and place them in the hot skillet. Sear them on one side, and then give them a flip. Add the shallot and garlic, and season with salt and black pepper. When the livers are browned on the second side, add the cognac and let it burn off, being careful of the flame. Add the Marsala, and let that bubble away. Add the capers and anchovies, and give everything a good stir. By now the livers should be cooked to a perfect pinkness. Turn off the heat and let them sit in the skillet for about a minute. Transfer the livers with all the skillet juices to a food processor. Add the sage, and pulse until you have a fairly smooth paste. Transfer to a bowl, and taste for seasoning, adding more salt or black pepper, if needed. Press a piece of plastic wrap over the paste to prevent it from darkening. You can make this a day ahead and refrigerate it, but make sure to return it to room temperature before serving. Place the chicory or frisée, figs, shallot, and fennel in a salad bowl. Whisk the vinegar, mustard, and olive oil together, and season with salt and black pepper. Pour this over the salad and toss. Divide the salad up onto four plates. Toast the baguette slices on both sides and spoon a generous amount of the chicken-liver paste on each one. Place three crostini around each salad and garnish with the capers. Serve right away. First off great blog. Im not sure if it has been talked about, but when using Opera I can never get the whole webpage to load without refreshing many times. Maybe just my router. Enjoy!